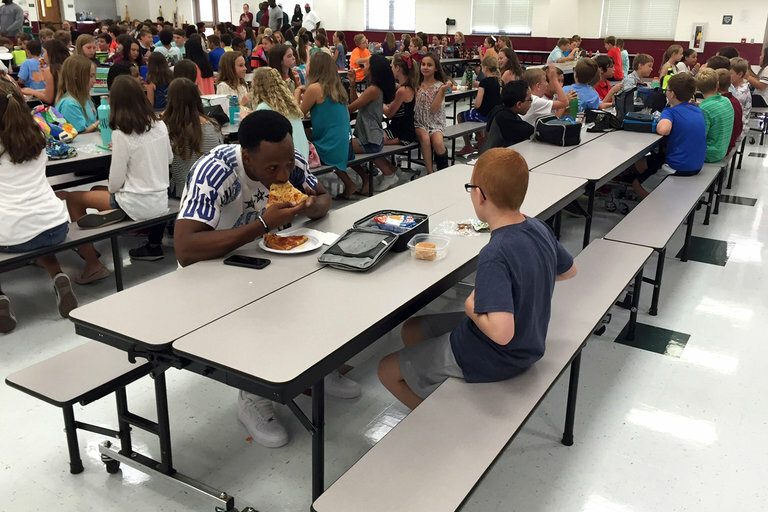 Travis Rudolph, a star football player at Florida State University in Tallahassee, is no stranger to the spotlight. He is famous for his award-winning athleticism, catching high and running far as a wide receiver. But it was Mr. Rudolph’s action off the football field that earned him national attention this week when, visiting a local school on a good-will visit with his teammates on Tuesday, he made a simple gesture. He sat down at a lunch table. In a moment captured on camera and shared widely on social media, Mr. Rudolph saw a boy sitting alone in the cafeteria at Montford Middle School. The boy introduced himself. His name was Bo Paske. He was a sixth grader. “And the conversation went from there,” Mr. Rudolph said. Although Mr. Rudolph, 21, did not know it at the time, Bo has autism and often eats lunch by himself, according to the boy’s mother, Leah Paske, who wrote about the moment and published the photograph on Facebook on Tuesday. Since then, the image of the football star eating pizza while seated opposite Bo has became an example of how a small act of kindness can go big. Mr. Rudolph, Bo and Ms. Paske have since been inundated with requests for interviews with national media organizations, appearing on news programs and in newspapers. Ms. Paske’s post has been shared more than 13,000 times, and the photograph has been circulating on Twitter, including on the account of Autism Speaks, an advocacy and support organization, from where it was retweeted nearly 600 times. Efforts to reach Mr. Rudolph through a family member were unsuccessful on Thursday. Ms. Paske did not immediately return emails and phone calls seeking comment. The story also shed light on some of the challenges that face families coping with relatives who have autism spectrum disorder, which the Centers for Disease Control and Prevention defines as a group of developmental disabilities that can cause social, communication and behavioral challenges in about one in 68 children. Ms. Paske said in her Facebook post that she was sometimes “grateful” that her son had the condition. She said that she asks him questions about his school experience every day. She said that a friend of hers was at the school on the day that Mr. Rudolph and his teammates visited. During the interview on Thursday, Ms. Paske recounted how anxious she had been as Bo attended middle school. As she spoke, Bo occasionally looked up at her and reached over to touch her arm whenever he saw that she was distressed. Bo said that it was “amazing” that Mr. Rudolph had chosen to sit down with him, adding that the player had even signed his lunchbox.